A diversion from books for today’s post. 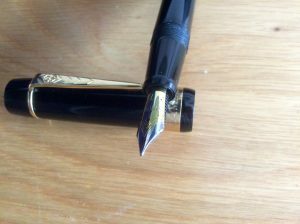 My wife bought me a lovely Mont Blanc fountain pen for a special birthday four years ago, and I became obsessive about fine writing instruments. I subsequently bought myself an Onoto (more on that shortly), and a beautiful red lacquered Nakaya Aki-tamenuri, made in Japan. The design at the top of my blog’s homepage is a photo of the first two of those pens. A handsome green Pelikan Souverän M800 followed on another birthday. Here’s an account of the history of Onoto, adapted from their website (from where most of the images are taken). 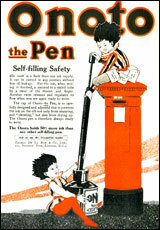 In 1905 British company Thomas De La Rue, printers of stamps and banknotes, was approached by George Sweetser, an outstanding Mechanical Engineer and Inventor, with a self-filling safety fountain pen which he had recently patented. 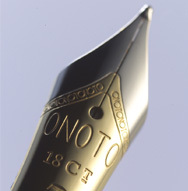 The first Onoto – Sweetser’s original plunger-operated self-filling fountain pen guaranteed not to leak – was manufactured by the company in London in 1905. 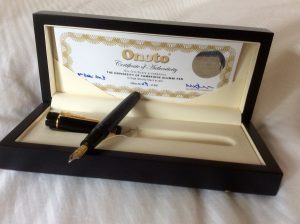 The Onoto pens were an immediate success in the United Kingdom and internationally, and were one of the very few 100% British-made pens prior to WW1. Famous Onoto owners included Field Marshal Haig (the WWI military leader), Winston Churchill and the Japanese author Natsume Soseki. The origin of the company name is disputed: it may derive from the name of a Japanese watchmaker, or it might simply be an invented word easy to pronounce in any language (like ‘Kodak’). 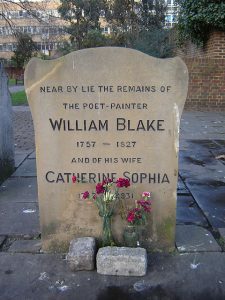 Initially the pens were made in Bunhill Row, Islington, London, where coincidentally the HQ of my wife’s former employer is located. There’s a famous nonconformist graveyard nearby (the earliest tomb dates from 1666); buried there are John Bunyan, Daniel Defoe and William Blake, among other notable figures. 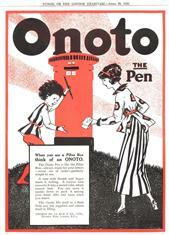 Onoto pen manufacture was transferred to Strathendry, Fife, Scotland in 1927 and continued there until 1958 when the factory closed its doors for the last time. After nearly 50 years Onoto production has started again. This entry was posted in Asides and tagged Mont Blanc pens, Nakaya pens, Onoto pens, Pelikan pens by Simon Lavery. Bookmark the permalink. Beautiful pens. I like writing with fountain pens. Caroline: I’m delighted to hear it – glad I’m not alone on this! Karen – so glad you agree. I’m not too keen on being such a pen geek! But hey, why not! Lovely post and loved all the images. I’m a confirmed fountain pen user: I have just Parkers, but a load of them with different nibs and many, many different coloured inks. I have convertors for all my pens so I can take advantage of the wonderful ink colours that can be found. 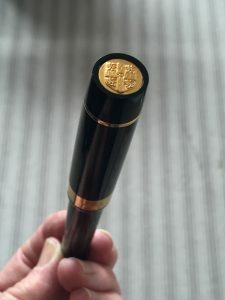 I am considering treating myself to a Good pen, and we’re lucky enough to have a pen shop here in Birmingham, so a trip will be in the offing soon. I have converters in some of my pens, too: all are ink-fillers, not cartridge – don’t like them. I have some good colours, too: shades of green, blue, black – and a rather Wildean ‘lavender’ that came free with the M Blanc pen! The Pelikan is good. Try Cult Pens online. They have an excellent range of all things stationery, including pens. They’re based in Devon, and have good prices. I’ve used them a lot, as there aren’t any pen shops of any size here in Cornwall. I also owned some Parkers over the years – also good pens. Budget makes of good quality (i.e. not cheap, but not expensive) include Kaweco, Ohto, Diplomat and the lower end Sailor. C Pens also do a charming mini pen range with their own brand name. Happy searching, Liz! That is rather lovely. I have a classic Mont Blanc Meisterstuck but hardly uses it as it leaks like anything and leaves me with blue fingers (plus I hardly ever write anything manually). 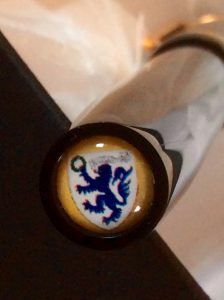 My wife has a rather nice Cross fountain pen which is very good indeed. I enjoyed the post too; it’s interesting to read about this sort of stuff from someone who clearly knows much more about it than I do. Glad you liked it Max. A leaky MBlanc – oh dear.